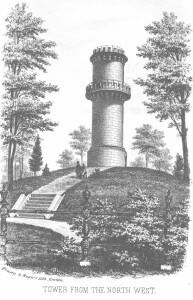 At a July 6, 1852 meeting Mount Auburn President Jacob Bigelow exhibited a model he designed for a tower. The Trustees voted that the committee of Jacob Bigelow, Charles Little, and Mace Tisdale should go on and erect the Tower in granite atop the highest summit in the Cemetery, Mount Auburn. The committee then contracted with Messrs. Whitcher & Sheldon, of Quincy, to erect the tower for $18,500. With the addition of stone steps and a broad platform, as well as the grading of the hill, the total expense came to about $22,000. The 62-foot tower was opened in 1854 without any formal dedication ceremony. It quickly became a popular destination due to its superb views of Boston, the Charles River, and several nearby summits. In addition to the panoramic view it offered visitors, the tower served as a landmark by which those in the surrounding towns could look to it and think of their loved ones buried there. 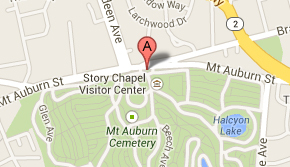 In the 1854 map shown above you can see the location of the tower and Mountain Avenue encircling it. Read more about the design and construction of Washington Tower in the Art & Architecture section.